Today marks the centenary of the sinking of the RMS Leinster, which resulted in the deaths of 564 people in the single-largest loss of life on the Irish Sea. A day of commemorations began with a wreath-laying ceremony this morning at the wreck site, near the Kish Bank just outside Dublin Bay, where the wreck lies on the seabed at a depth of 28 metres. The RMS Leinster had just set sail from Kingstown (now Dún Laoghaire) bound for Holyhead, when it was sunk by a German U-boat in the closing weeks of World War I. It took just 12 to 15 minutes to sink. More than 9,000 An Post staff nationwide observed a minute's silence at 9.50am in memory of the 21 postal staff who were working in the ship's mailroom when it was struck by the first torpedo. 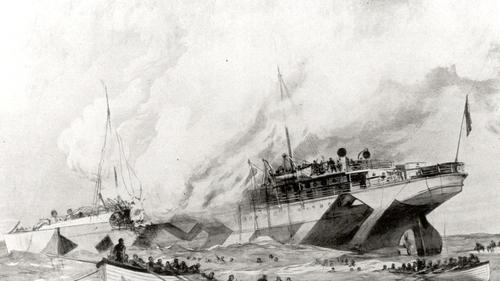 The official State centenary event for Ireland's worst maritime disaster took place at Moran Park in Dún Laoghaire and ended just after midday. Later today, the wreck of the RMS Leinster will come under the protection of the National Monuments Act, which covers all shipwrecks over 100 years old. The Leinster was operated by the City of Dublin Steam Packet Company as one of four mail boats named after Irish provinces.